The following digital preservation standards and guidelines are developed based on the study of electronic records produced by various e-governance mission mode projects namely e-district, MCA21, e-Office, Computer Aided Registration of Documents, CBDT, etc and several international projects of similar nature. The e-Governance Standards Division, Department of Electronics and Information Technology, Government of India has approved the standards for its adoption in the e-government projects across India. This standard provides best practices and guidelines for production of preservable electronic records and its management in the context of e-governance. It is applicable for those e-records that need to be retained for long durations (e.g. 10 years, 25 years, 50 years and beyond) and the e-records that need to be preserved permanently. The core concepts of ‘preservability’ are based on the requirements specified in IT ACT, ISO/TR 15489-1 and 2 Information Documentation - Records Management and ISO 14721 Open Archival Information Systems (OAIS) Reference Model. It introduces 5 distinct steps of e-record management i.e. 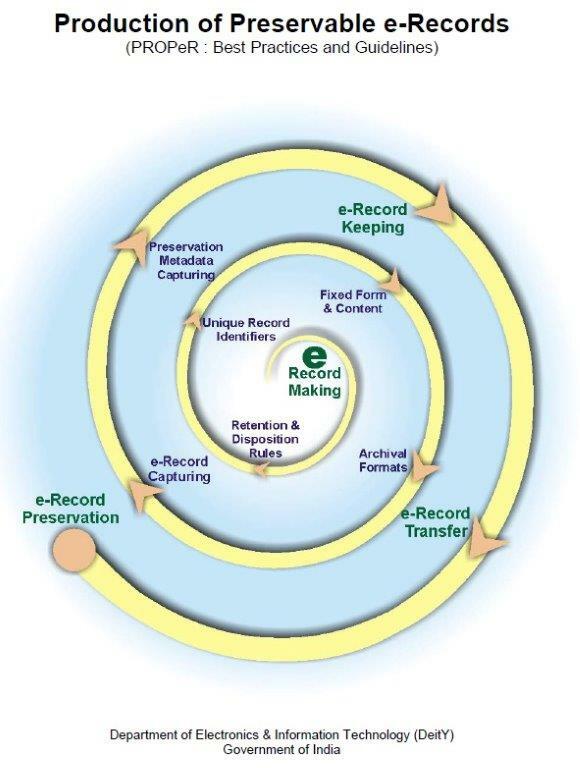 e-record making, e-record capturing, e-record keeping, e-record transfer to trusted digital repository and e-record preservation which need to be adopted in all e-governance projects. 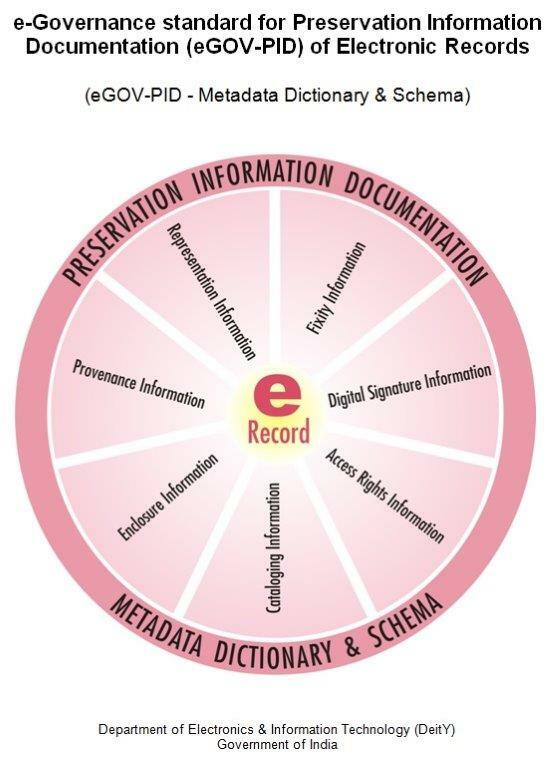 The eGOV-PID provides the standard metadata dictionary and schema for describing the preservation metadata of an electronic record. This standard proposes to capture most of the preservation information (metadata) automatically after the final e-record is created by the e-government system. Such preservation information documentation is necessary only for those e-records that need to be retained for long durations (e.g. 10 years, 25 years, 50 years and beyond) and the e-records that need to be preserved permanently. The implementation of this standard helps in producing the valid input i.e. Submission Information Package (SIP) for archival and preservation purpose as per the requirements specified in theISO 14721 Open Archival Information Systems (OAIS) Reference Model. The eGOV-PID allows to capture the preservation metadata in terms of cataloging information, enclosure information, provenance information, fixity information, representation information, digital signature information and access rights information. Examples of Provenance Information, Representation Information and Rights Information are not provided as this information is unavailable, which is essential for digital preservation.